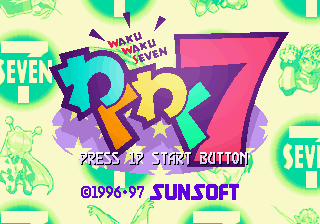 Waku Waku 7 (わくわく７) is a fighting game by Sunsoft. Originally for Neo Geo MVS arcade hardware, it was ported to the Sega Saturn in 1997. It was only released in Japan. Waku Waku 7 is a one-on-one fighting game and spiritual sequel to Galaxy Fight. The Saturn port is often looked on as being a weaker version, as despite requiring an extra 1MB RAM cartridge, it offers more pixellated backgrounds and longer loading times than the Neo Geo version. Special Thanks: Kazuyuki Watanabe, Naoki Kodaka, Kazuyo Umemura, Tatsuo Mori, Kazuko Harman, Naomi Sakaguchi, Megumi Masuko, Noriaki Kitamura, Sunsoft All Staff, And You! Main article: Waku Waku 7/Magazine articles.